Almost immediately after moving to the Oliver community, Rev. Sheila felt God’s power and the call to Christ Church. She became involved with numerous committees and outreach projects, including coordinating the Christ Church Community Dinner Program. A passionate advocate for those in need, Sheila loves this ministry and continues to be inspired by those living on the margins of society. 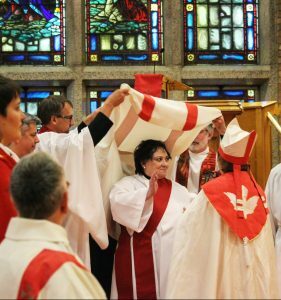 On September 14th, 2017, Sheila was ordained as a deacon, continuing on in her journey to live her life as one who serves.